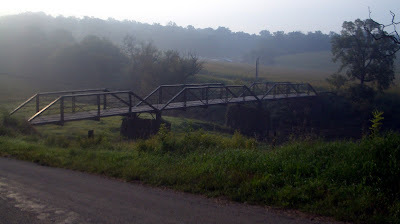 D got our bikes fixed up so I decided to coast downhill all the way to this bridge just on the outside of town. It's about one mile and ALL downhill. I spent some time walking back and forth on the bridge examining all the worn out boards and touching the bent nails and splintering wood. 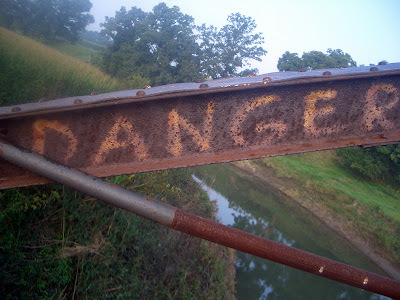 When I walked along the middle section of the bridge it would rattle the metal supports and make a musical sound. The birds were chirping and the crickets and frogs were still making all of their lovely morning sounds. The cows were bellowing and echoing from somewhere in the various neighboring fields. And the best part of all is that there wasn't a car in sight. 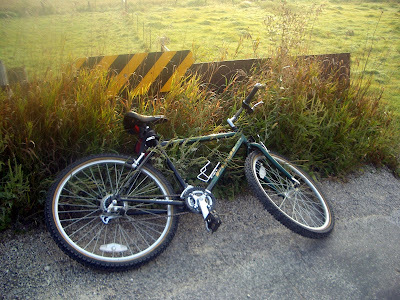 I parked my bike and walked the rest of the way up and around the hills. 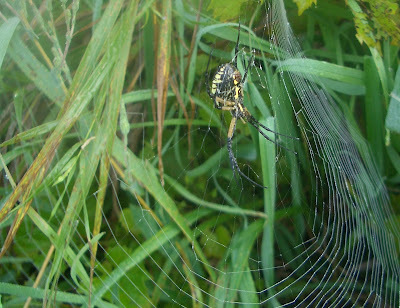 The strange thing with spiders is that when they are in their natural habitat I'm less likely to have the fearful physical reaction that I do when they are inside my home or on my property. As much as I proclaim to hate spiders and would gladly choose a world without spiders in exchange for all the bugs they eat, I think they are fascinating and I respect them...when they stay where they belong. 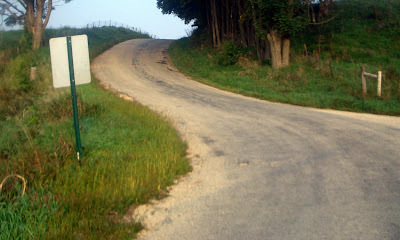 I wound my way up this road for another mile...or maybe it was two. ...and as I finish this post I'm reflecting on what I'm trying to say here. I don't think of myself as very profound. I seem to have a lot of pictures with bridges and roads...and a spider which is one of the things I fear most in the world. So, I've crossed a major bridge in my life, I'm heading down a new or even familiar road and I'm boldly facing my fears...there! And as I was going through my pictures I realized that I only took pictures of flowers past this point. So, the walk back to the bridge was a piece of cake...but once I hit crossed back over the bridge again it was ALL uphill. I was able to ride some of it but I also walked some and I also stopped for a drink of water at the park in town. It was a good ride/walk and I'm sure I'll do it again. Eu tentei postar um comentário ontem, mas não consegui. So, gostei muito destas fotos, principalmente, porque eu posso ter uma idéia de como é o lugar onde você vive. Legal mesmo. 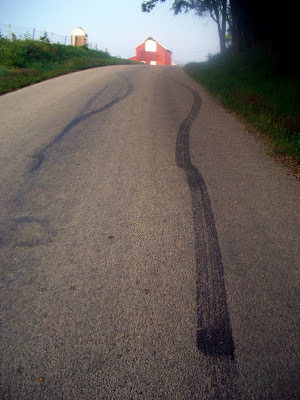 Aliás, quando é que foi essa sua caminhada de bicicleta? no fim de semana? Hey there, amiga! (ok that's all the Spanish you're going to get from this chiquita.) 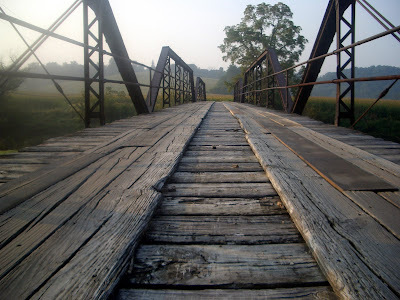 I LOVE this blog and the way you tied in the bridge and spiders with your fears. Way to go! centria, Thanks for visiting. I must admit that your blog has inspired me a lot! I was thinking about your "modern day driveabout" post when I went out for my bike ride and then began to journal it here. Ok, so you don't know much Spanish but can you read the Portuguese comments that my "anonymous" commenter has left me?